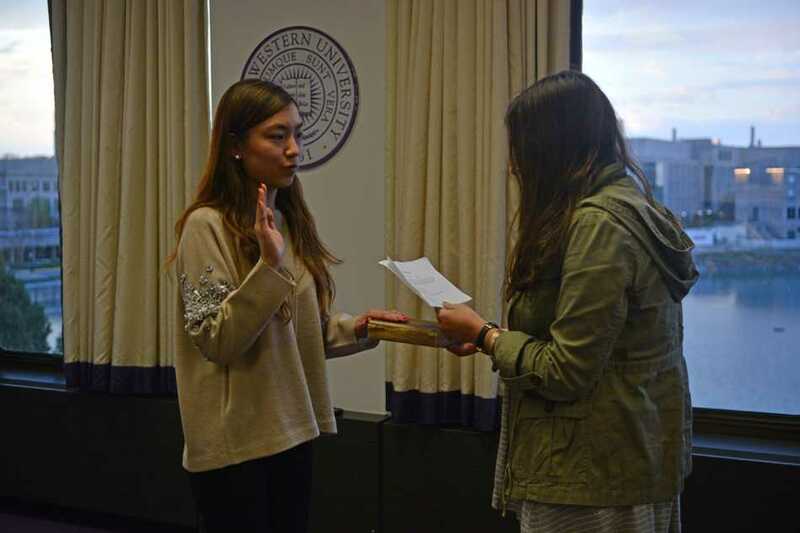 Weinberg freshman Florence Fu is sworn in as vice president for public relations. Fu will succeed Medill senior Jaime Toplin. Associated Student Government Senate confirmed a vice president, considered a budget and discussed the organization’s culture at a brief meeting Wednesday. Following last week’s four-hour meeting, Senate met for just over half an hour with a light agenda. Senate voted to confirm Weinberg freshman Florence Fu as vice president for public relations. Fu, a former Daily staffer, said ASG’s committee system sometimes makes it difficult for members to know what projects other parts of student government are working on. Fu is the design editor for STITCH Magazine, an experience she said will help with designing outreach materials for ASG. Later, the budget committee introduced ASG’s operating budget for next school year. Former executive vice president Erik Zorn said the proposal reflects ASG’s recent efforts on mental wellness. “We do believe that mental health is something the University needs to continue to make a top priority,” Zorn said. According to the proposal, almost half of the $80,000 budget will go back to students through stipends, grants and awards. One example is the $4,500 Event Subsidy Fund, which would allow 100 lower-income students to receive up to $30 per quarter in subsidies to cover WildCARD-ticketed events. The Center for Student Involvement will match the funding, bringing the fund’s total to $9,000. Senate will vote on the budget May 13. ASG President Noah Star spoke about changing the culture of student government to make it more relaxed and welcoming. He announced that future Senate meetings would be themed, beginning with a pajama day next week. Star said making Senate a fun, easygoing space is important for making it an effective governing body. “We’ve made a ton of strides in Senate over the past year for making the space more comfortable for each other and our guests,” Star said. This post was updated at 12:35 a.m. April 30 to clarify Florence Fu’s previous involvement with The Daily. Correction: A previous version of this article misstated the school that Florence Fu is in. She is in Weinberg. The Daily regrets the error.